I enjoy using a butterfly band prop — credit to Irina Gorin — to help my beginner students develop a physical approach to the instrument that is comfortable and effective for ideal sound production. In Irina’s words, the butterfly exercise helps students experience “relaxation of the hand/wrist, a floating arm, and a gentle touch”. 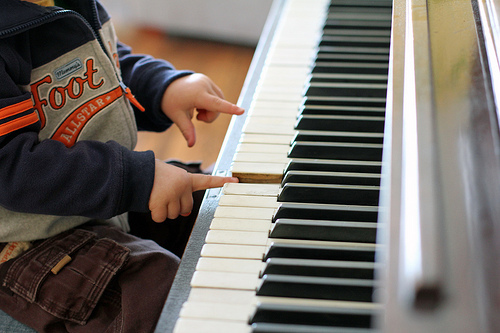 In the comment section of previous post, a reader asked for suggestions with helping a young student connect notes on the staff with their names and their corresponding piano key. I gave a response in the comment section, but thought I would share some of those thoughts with you all as a separate blog post! Sometimes, beginners (or even transfer students) seem to be missing a piece of the puzzle for understanding note-reading on the staff. Below is a description of how I would systematically try to figure out what is missing with a student who is struggling with note-reading! I would first make sure the student can say the musical alphabet verbally forwards and backwards. This seems basic, but believe it or not, sometimes beginners miss this step, and then note reading makes little sense to them! While browsing Pinterest, I was inspired by this picture by the blogger Becki Lewis. Becki’s Finger Number Beanbag Game is a simple but very effective game for young beginner piano students. Students stand in front of the mat and drop the beanbag. Then, they name the finger the beanbag landed closest to, and correctly identify RH or LH. 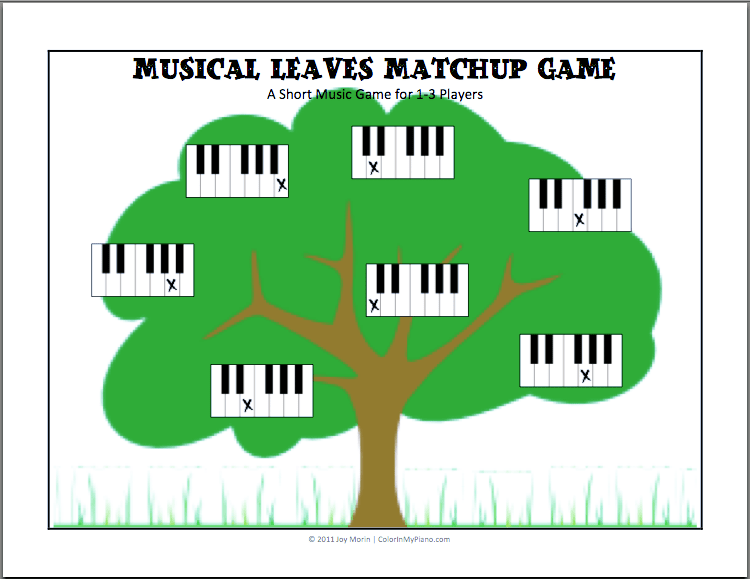 I tried this game out with my Piano Readiness Class, and they enjoyed it! It is a quick, easy activity that effectively reviews the hands/fingers. Becki used a marker and a piece of cardboard to draw the outline of two hands. I designed a printable on the computer to use with my students, and Becki gave me permission to share the printable with you here: visit the Printables > Games page, and scroll down to the F’s for “Finger Number Beanbag Game.” I laminated the two pages and taped them together, so that they fold for easy storage. Enjoy! I use them during class when I am teaching or reviewing concepts. They can be useful for games too. For example, I like to have students hold up or point to the correct symbol while I improvise high/low or loud/soft music on the piano. I printed them on cardstock and laminated them to make them more durable. There are other ways to use these signs: They can be printed for beginner private students to keep as a reference. Or, they can be hung up in on the wall in your studio. You can download the pdf by visiting the Printables > Other Resources page and scrolling down to the S’s for “Signs for Beginner Piano.” I hope you can find some way to use these with your students! 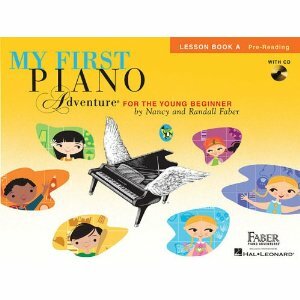 As big of a fan as I am of Nancy & Randall Faber’s materials for piano students, somehow I’ve never had a chance to try out their “My First Piano Adventure” books — until now. After trying out this book with a new 5-year-old student last week, I am wondering why in the world didn’t I check this out sooner?! My First Piano Adventure is designed for young beginners, ages 5 and 6. I suspect that 4-year-olds would also thrive using this book, and maybe even precocious 3-year-olds — but don’t quote me on that until I’ve had more time to test it out. You’ll need to buy fabric or foam leaves and mark each with a letter from the musical alphabet using a marker or felt tip pen. The student is instructed to match each leaf to it’s spot on the tree, until the whole tree is filled. The game only takes a few minutes, so it’s a great game to do on the piano bench at the beginning or end of a piano lesson. Don’t ask questions that you don’t really want answers to. Examples: “Did you like that?” or “Do you want to try it on your own now?” Sometimes if given the option to opt out of something, children will say “no” simply because you’ve given them a choice. :) It’s better to make statements. I don’t know about you, but I’m always on the lookout for creative and inexpensive items for my teaching. The dollar store is one of my favorite places to go! There are others who have shared alphabet card printables similar to what I’m posting today, but I’m adding mine to the mix anyway. :) I wanted some that would work well to print onto colored cardstock paper. Since I don’t have a color printer, this is an easy way I can still get colorful things to use with my students! I used these cards with my new weekly Homeschool Music Class (just started last week, thanks to Sheryl’s recent post at her Notable Music Studio blog) and with my Piano Readiness Class. My students LOVED making “musical alphabet snakes” in order to learn how the musical alphabet is different from the regular alphabet. Included in the pdf is a card which outlines some other possible activities to do using the cards. These activities work great in both group settings and private lessons. Do you have some other activities to share that involve alphabet cards? Share them in the comments! 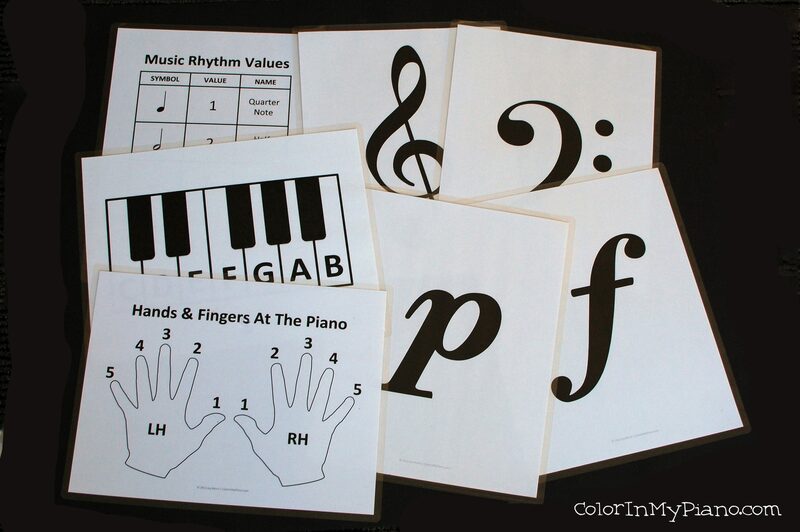 To Download: visit the Printables > Other Resources page and scroll down to the M’s for Musical Alphabet Cards. Mr. Blickenstaff introduced this session by commenting that at conferences and workshops, we often hear ideas for teaching intermediate and advanced students, but we don’t very often hear ideas for teaching beginners during that first year of piano lessons. The purpose of this session to give a refresher of sorts and to provide new ideas for teaching beginners, particularly in groups. Mr. Blickenstaff basically led us through a series of short activities that he uses during group classes with beginners. He begins the first few classes with some icebreaker activities that all students can succeed doing. These initial successes set the tone for the entire year!